DUAL ACTION BALL PUMP：Suitable for ball games, swimming laps fast inflatable. The base of this pump is extremely compact and made for very high impact. You can leave it in your soccer bag and it will withstand anything. With the extra needles provided in the packaging, theres no reason this little hand air pump shouldnt last many football seasons. - Simple and easy to put together. - Even more simple to use. - Made using quality materials to guarantee durability. - Conveniently sized to fit in sports bags. 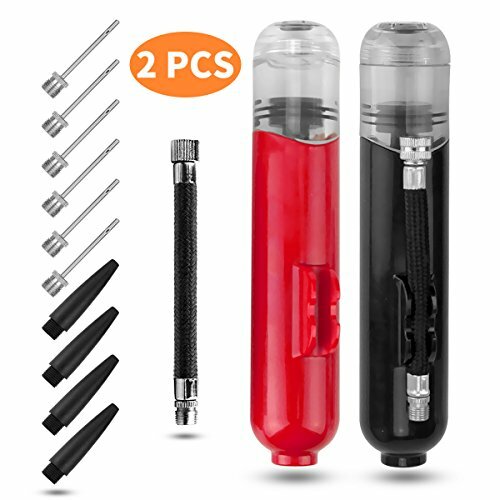 『DUAL ACTION BALL PUMP STURDY ENOUGH FOR LONG USAGE』About needles and Pump bending - unique soft needle plug system prevents needle from bending, Strong Shell and Bold Pump Rod make it more energy saving. 『SUITABLE TO USE FOR ALL KINDS BALL AND FLOATS』Including Football, Handball, Basketball, Volleyball, Beach Volleyball, Football, Fitness Balls, Etc.Simply take small needle out of the top storage spot, screw it in and pump up any ball. 『DUAL ACTION MECHANISM FOR TWICE FASTER』The Hand Pump is design in dual action ball pump provides faster pumping because it injects air with both slides of the piston. It will considerably save your time and effort because it inflates your balls during both the pushing and pulling action. 『BEST EASY SIZE FOR A SPORTS PLAYER CARRY』6.3*1.3" Volume, only 0.1 kg weight, easily fits inside any bag, So you can carry it to any courts or fields, Don't worry about 1pcs shortage. Our set is 2pcs, unit price is sold. If you have any questions about this product by Icanbee, contact us by completing and submitting the form below. If you are looking for a specif part number, please include it with your message.